"Having uncovered the dark secret of her enigmatic classmate, Edward Cullen, Bella Swan embraces her feelings for him, trusting Edward to keep her safe despite the risks. When a rival clan of vampires makes its way into Forks, though, the danger to Bella has never been more real. Will she make the ultimate sacrifice to protect the people dearest to her?" OK so Twilight has become kind of old for some people, but its what reignited my love of books and made me feel passionate about something again which I hadn't felt like in forever, so the series will always be special to me. I loved the first part of this graphic novel and am so excited to see the second part. I adored the artwork in the first & am sure I will feel the same about this. I wish that I could get into Graphic Novels but I just can't. Here are my WoW selections for this week. 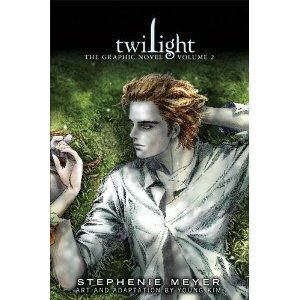 Twilight got me back into reading as well (at the suggestion of the high school sophomores I was teaching at the time!). I haven't read any graphic novels. I doubt these would be the ones to get me into them, but I'm looking forward to the Hush, Hush by Becca Fitzpatrick graphic novel coming out in October.